• Includes one right or one left single shared cantilever and mounting screws. 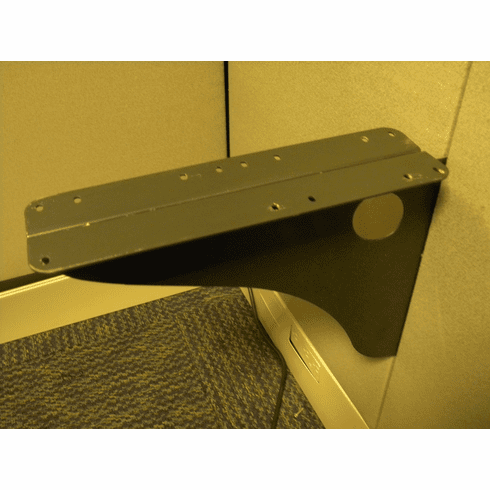 • Provides cantilever support for adjoining worksurfaces. • Installs in panel connector slots. • Cantilever bracket can be used on either an 18''(457mm)-, 24''(610mm)- or 30''(762mm)-deep worksurface. • A shared cantilever can be disassembled to create one left or one right cantilever depending upon how specified. • Mounts worksurface in one inch vertical increments from a minimum of 21''(533mm) high. • Provides clear access leg swing when supporting 24''(610mm)- and 30''(762mm)-deep worksurfaces at standard 29''(737mm) height. • Standard in Charcoal finish color only.